Although you need many different items for a home brewery setup, the home beer brewing equipment that you need is not that expensive, running under two hundred dollars for a basic brewing kit. The home beer brewing equipment set up does not have to be fancy; it just has to have the basic materials to allow the beer to ferment properly a good recipe and it has to be properly bottled. When you have the right home beer brewing equipment then all you need is to pick the type of beer recipe that they desire and start cooking! The first item of beer brewing equipment that has to be bought is of course the brewpot, which should have at least a sixteen quart capacity. This is a special pot that must be made of either stainless steel or enamel-coated metal so that the beer does not brew and end up picking up the flavor of the pot. This ensures that the beer will have the pure flavor of the recipe rather than having a strange taste from the pot it cooked in. 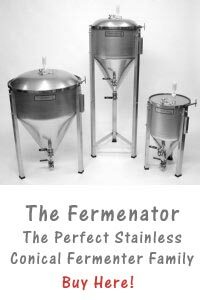 The next beer brewing equipment item needed is the primary fermenter which should have a capacity of seven gallons at least. This is an important piece of beer brewing equipment because it is the place the beer starts to ferment in. The lid to the primary fermenter must fit tightly on it so that it locks out all air. These are usually made of plastic and have to be bought specifically for this purpose to work correctly. The next beer brewing equipment item needed is the airlock and stopper which are used to help the carbon dioxide escape from the primary fermenter during the fermentation process. This is an important piece of beer brewing equipment that must work properly so that the air from the outside does not get in while the carbon dioxide is escaping out of the fermenter. Other beer brewing equipment needed to create a home brewery setup is a plastic hose, bottling bucket, bottles, bottle pushes and bottle cappers. These items need to be kept extremely clean so that the beer can be safely and cleanly be transferred from the fermenter into the bottles where they will be sealed for consumption. Glass bottles are the best to use for the bottling process and should be a dark color so that the light does not affect the quality of the beer. One other beer brewing equipment item that is needed for the fermenter is a thermometer that can stick to the side of it, such as are used on fish tanks. 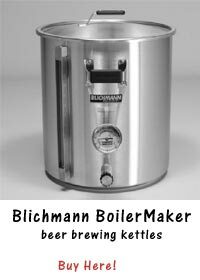 You can buy all this beer brewing equipment separately or you can buy it all in a good home brewing kit. Everything you need is in it and it can be used over and over again.